DUBUQUE, Iowa — Loras College Dance Marathon (LCDM) has earned “Best Program Video” by Children’s Miracle Network Hospital staff members. The Marathon supports local families whose children have been treated at the University of Iowa Stead Family Children’s Hospital. “I was really shocked and definitely thrilled, to see our video was awarded over large universities,” Brooke Boddicker, co-creator, said. The video was created to raise awareness for Child Health Day on Oct. 2. On this day, those living in North America express the necessity of a year-round program to protect and develop the health of children. More than 200 colleges and universities participated in Child Health Day and Children’s Miracle Network challenges. The challenges included registration challenges, donate challenges and spread the word challenges. “We are lucky to have access to quality equipment and to have an amazing education that allowed us to make a video worth this recognition,” Trevor Fannon, the other co-creator, said. In April, LCDM raised $216,061 for the Children’s Miracle Network and the University of Iowa Stead Family Children’s Hospital, a $15,000 increase over last year. More than 250 dancers, 150 miracle family members, and countless alumni and corporate sponsors raised more than $1.6 million for the hospital and the network. 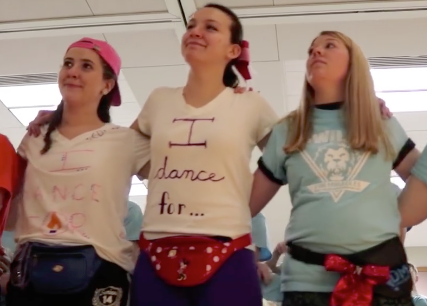 To view Loras College Dance Marathon’s award-winning video, search, “Loras College Dance Marathon Commits for the Kids” on Facebook, or follow www.bit.ly/2ys6Oje. For information on LCDM, contact Boddicker at brooke.boddicker@loras.edu or (319) 310-4830.